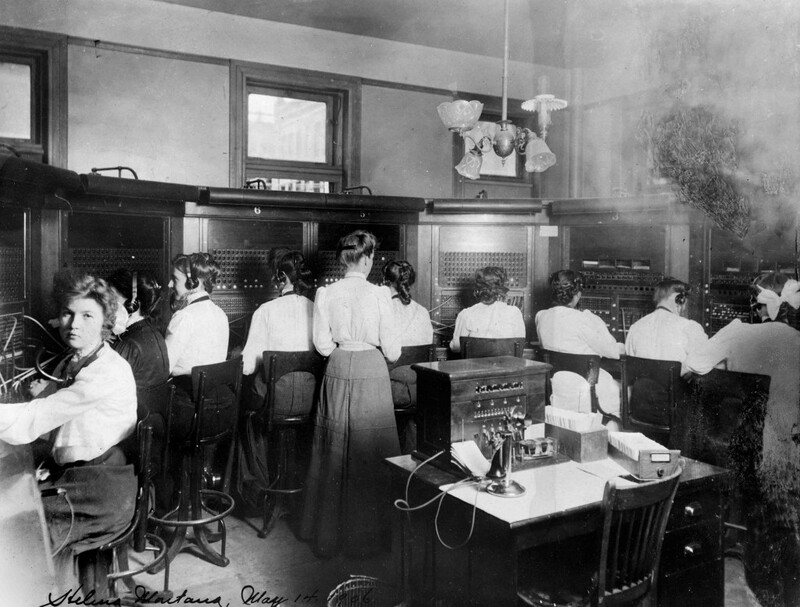 Although female telephone operators may have been recognized for their abilities, they often worked long hours for very low pay. For example, in 1907 Rocky Mountain Bell operators’ wages were frequently as low as thirty to forty dollars per month for a ten- to twelve-hour day. That year, Butte operators struck for higher wages and an eight-hour day, and the company, in recognition of their united strength, almost immediate agreed to a minimum wage of fifty dollars per month, an eight-hour day, and a closed shop. That same year, the legislature enacted a law banning the employment of girls under the age of sixteen as telephone operators and in 1909 limited the hours of telephone operators to nine hours per day in cities and towns of more than three thousand people, except under special circumstances of illness or emergency. The board was a vast expanse of eyes, with, at the base, a dozen or so pairs of plugs on cords for connecting and an equal number of keys for talking, listening, and ringing. On a busy day these cords were woven across the board in a constantly changing, confusing pattern; half the people using telephones were convinced that Central was incompetent or hated them, and Central—flipping plugs into holes, ringing numbers, trying to remember whether 44 wanted 170-K or 170-L, because if she went back and asked him, he’d be sure she was stupid—was close to hysterics. It was every operator’s dream that when her ship came in she would open all the keys on a busy board, yell “To hell with you,” pull all the plugs, and march out in triumph, leaving everything in total chaos. Nobody ever did. We felt an awful responsibility toward our little corner of the world. We really helped keep it running, one girl at a time all by herself at the board. Read Dorothy Johnson’s reminiscence, “Confessions of a Telephone Girl,” in Montana The Magazine of Western History 47, no. 4 (Winter 1997): 68-75. You can find links to the full text of all Montana The Magazine of Western History articles relating to women’s history here. After her brief stint as a telephone operator, Dorothy Johnson went on to become a premier Western novelist. Read about her later career here. Arguimbau, Ellen. “From Party Lines and Barbed Wire: A History of Telephones in Montana,” Montana The Magazine of Western History63 no. 3 (Autumn 2012): 34-45. Martha Edgerton Rolfe Plassmann claimed that she and her husband brought the first telephone equipment to Montana in 1876 when they came to Helena for Herbert to take charge of Helena Schools. Here is a bit from Great Falls Yesterdays: “Mr. Rolfe was the first to introduce the telephone in Montana when it was just beginning to be regarded in the east as a practicable means of communication. It was in 1877, when he was at the head of the Helena schools, he obtained a few of the first instruments to come west [in fall of1876] and installed them on an old telegraph wire he had previously strung between his home and that of Colonels Sanders, for communication purposes. This experiment was shortly followed by the installation of lines to Virginia City and Deer Lodge, the first long distance telephone system. When I was a teenager in the late ’60’s, I worked with a woman who had been an operator. She said that late at night, at the end of a long shift the operators would change how they answered the switchboard. Instead of “num-ber please,” they would, in the same lilting tone, say, “catch-the fleas,” “hon-ey bees,” and any number of other playful phrases. ……………”Perhaps the biggest indicator of how integrated phones had become into people’s lives happened in 1946 when a fire swept through the village of Desbarats. While Desbarats’ entire business block was destroyed, leaving $300,000 worth of damage, the phone operator stayed at her post. Tillie Bretz, at the age of 91, had been the phone operator since 1914, when telephone service first came to Desbarats. 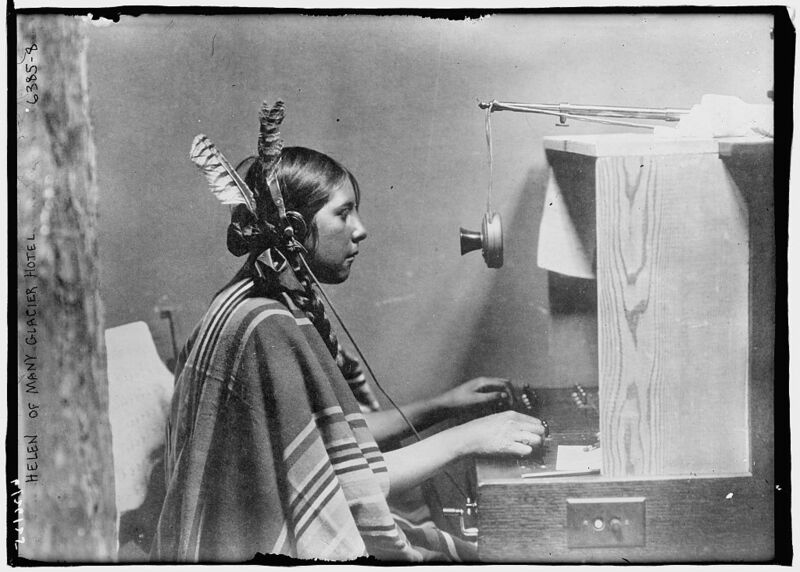 At this time Tillie was the oldest telephone operator in North America. She had never taken a vacation day or a sick day, even when she broke her arm. The Globe and Mail printed a photo of her, having a quick nap at her station, having been exhausted by all of the activity on the day of the fire.”………..